The muxponder are a great way to support many lower data rate services with a single fiber or fiber pair. The main feature of eWAVE's muxponder is being aggregation and Ethernet switching. 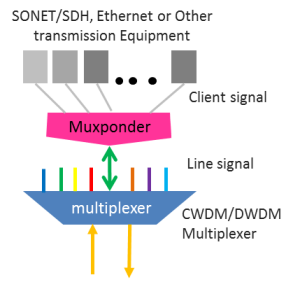 Muxponders use pluggable transceivers (SFPs on the client side and XFPs on the line side) so they can be used in a wide variety of applications. Clients can be electrical or optical (1310 or 1550 nm), co-located or some distance away. Line side interfaces can be fiber, CWDM or DWDM with a variety of reaches supported. a) The standalone chassis of muxponder eWAVE101xx Series. eWAVE101xx is a series of muxponders which based on 1U chassis. It aggregates 10/20/24 GE ports into 1 or 2 10GE ports, and supports OTN and C/L band full tunable transmission in long haul. It supports transmission distances up to 140km with a single pair of SMF or DSF. If EDFA is added, the distance can reach up to 800km. In addition to aggregating 24 GbE inputs into 1 or 2 10 GbE output, eWAVE10124 may also be used as an Ethernet switch with provider bridge VLAN capability. b) The hot pluggable module which can be plug into DWDM or CWDM transmission systems (eWAVE4107 or eWAVE4107DiR). Applied to scenario such as Data center consolidation, Storage extension, Resource virtualization, Strategic Site Selection.